The favorable exchange rate between most major currencies and the Argentine peso entices many tourists to head to the mall. Note that stores list prices in Argentine pesos, not US dollars. Don’t be confused by the $ sign. It means pesos, not dollars. A tax of 21% is included in the price. It will not be added on top. Tourists can claim a tax refund on purchases over $70 pesos made at participating stores. This only applies to products made in Argentina. Here’s more information on tax free shopping in Argentina. Most malls provide free shuttle service from your hotel. Check with your concierge. The concierge may also be able to give you a discount card good for 10% off at many mall stores. You can also check for special offers for tourists at the customer service booth inside the mall. Opened in 1990 and renovated in 2008, Alto Palermo is loaded with clothing stores, most of which are geared to the female shopper. Stores include Zara, Tommy Hilfiger, La Parfumerie, Timberland, Rouge, Mac, Gap and New Man. There’s also a Starbucks if you find yourself craving a frappuccino. You can change currency inside the mall at Metropolis. Alto Palermo is located at the corner of Santa Fe and Coronel Diaz. Abasto Shopping is the largest mall in Buenos Aires with over 230 shops, movie theaters and an enormous food court. There’s also an arcade and an educational museum for kids. So if you have kids this mall might be your best bet. The mall is located at Corrientes 3247 next to Carlos Gardel station on the “B” line of the subte. Galerías Pacífico is the mall most visited by tourists due to its central location on Florida at Córdoba. This is an upscale mall in a ritzy part of Recoleta. Among several levels of clothing stores you will also find a good wine store, movie theaters, cafes and restaurants. Here’s more information on Patio Bullrich. It’s located on Posadas across from the Caesar Park Hotel. Paseo Alcorta in Palermo Chico is a good place for trendy fashions. A highlight of this mall is the large and well-stocked Carrefour supermarket. It’s located at Figueroa Alcorta and Salguero. If you really want to have a mega-shopping day, start at Galerias Pacifico then walk north along Florida to Santa Fe. Then walk all the way up Santa Fe to Alto Palermo. There are TONS of good stores all the way up Sante Fe. Amazing shopping! A new mall just opened in Saavedra yesterday. It’s called Dot Buenos Aires. 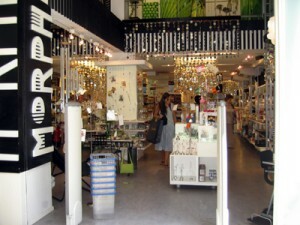 It has 160 stores and is located at Vedia and Melián, near General Paz and Panamericana.